For iron, manganese and hydrogen sulfide (H2S, rotten egg odor). The MetalMaster™ Water Treatment and Filtration System is an effective chemical-free, oxidation-based technology exclusively available through Vitasalus/Equinox Products. The MetalMaster system is capable of removing high levels of iron, Manganese, sulfur/hydrogen sulfide (rotten egg odor), silt, turbidity, and other trace amounts of metals such as copper, lead, arsenic, and uranium. The MetalMaster™ system utilizes a unique and premium-grade MetalMaster media which is designed to significantly outperform other historically popular oxidation-based media such as Pyrolox®. The MetalMaster system is designed to be used in place of traditional forms of iron treatment and can be installed on either well or municipal water supplies. It can be used as a stand-alone unit or as the perfect companion to softeners, RO systems, carbon-based filters, etc. 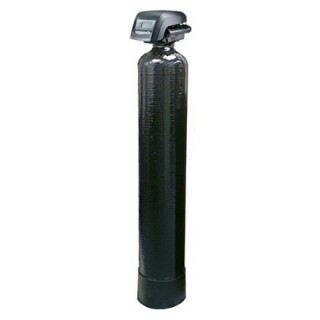 "John, We have installed our MetalMaster Filtration system, and it is wonderful. We can drink the water out of the tap. It has made such a difference and it has only been in 4 days. There are two guys that work with Bill at the State and they are very interested in them. We have told just about everyone that we have seen about them. I have given them your web site address. I still can not find the site for the MetalMaster. Can you e-mail that to me? I will then print it out and use as a reference. I thank you for steering us to this system. We really appreciate it. You may use this as a testimonial if you would like. Best Regards and peace to you and yours this holiday season." 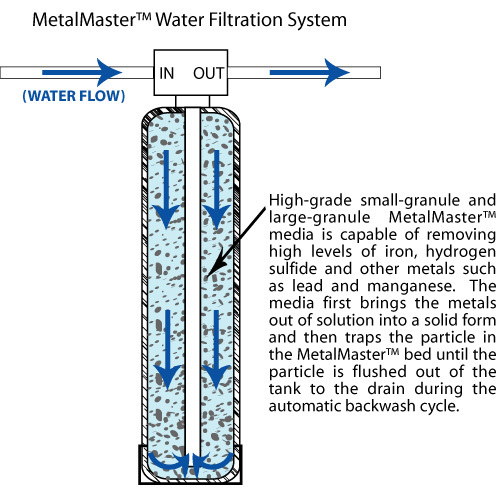 System built using the premium MetalMaster media which contains more active ingredients and oxidation capability than Pyrolox, therefore, the MetalMaster media significantly outperforms Pyrolox® when addressing iron, manganese, hydrogen sulfide/sulfur, rotten-egg smell, and other heavy metals. Shipped Pre-Assembled (tanks come pre-loaded with special media) and Ready-To-Install which greatly simplifies the installation process and significantly reduces installation time and cost. No maintenance required on this system so there are no filters to change, salt or any other regenerate. Simple-to-use control valve for automatic backwashing. 5 year warranty. Rust proof wound fiberglass polyethylene tanks feature 150psi operating pressure. 10 year warranty. You may also want to consider the following systems which would install in-line, just after the MetalMaster system, unless otherwise noted. After adding the MetalMaster to your shopping cart, click the "Back" button to return here so that you may make your next selection below of the PureMaster™, FluorideMaster™, HardnessMaster™, or the Combo Package. The HardnessMaster Electronic Water Conditioner: an effective and healthy alternative to water softeners and de-scalers. Set it and forget it. NO more salt! NOTE: Installs in-line before the MetalMaster and any other systems. PureMaster V-Series Whole House Water Filtration Systems: highly-specialized systems designed to remove up to 99.9% chlorine, VOCs, THMs, atrazine, benzene, pesticides, insecticides, tastes, odors and hundreds of other potential contaminants and harmful chemicals from the water entering your home. FlourideMaster Whole House Fluoride Filtration System: highly-specialized system designed to remove up to 99.9% fluoride from all of the water entering your home. These shipping terms only apply to customers in the USA mainland only, excluding Hawaii and Alaska. For customers outside the USA mainland, the customer will be contacted with the final shipping total before processing order. To begin your order process, start with the "Add to Cart" button at the top of this page. MetalMaster™, PureMaster™, FluorideMaster™, and HardnessMaster™ are trademarks of Vitasalus, Inc. Difference in a few short hours, Review by Angela W.
No iron!, Review by Mike G.
Impressive change to water quality, Review by Don D.
A year ago I bought property and had a well dug. The water was not good quality. It was brown/orange, tasted bad and caused rust stains in all the sinks, shower and it even ruined some of my clothes. It took your MetalMaster system along with two different additional cartridge filters to get the water I wanted, but so far it's been worth every penny! I've only had it in place for a week, but I can't believe the change in my water quality. Thanks to you and especially your Tech. Support Team for providing such helpful information on what I needed. You guys rock! Hydrogen sulfide - removed!, Review by Fred G.
I've had the MM-6 Metalmaster installed for about three weeks now, and at this point I want to say how pleased I am at it's performance. 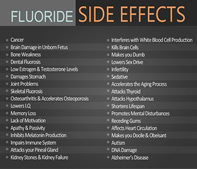 My main problem with my water was hydrogen sulfide, and the Metalmaster removes every trace of it. I can finally get a good,cold drink of water from my tap now without the periodic installation of a carbon filter. Thank you for such a good product! Completely satisfied!, Review by Bill G.
Great and quick, Review by Reinaldo S.
Great product!, Review by Jerry B. Great item, Review by Matt T.
Highly recommended, Review by Jane S.
No More Odor!, Review by Michael S.